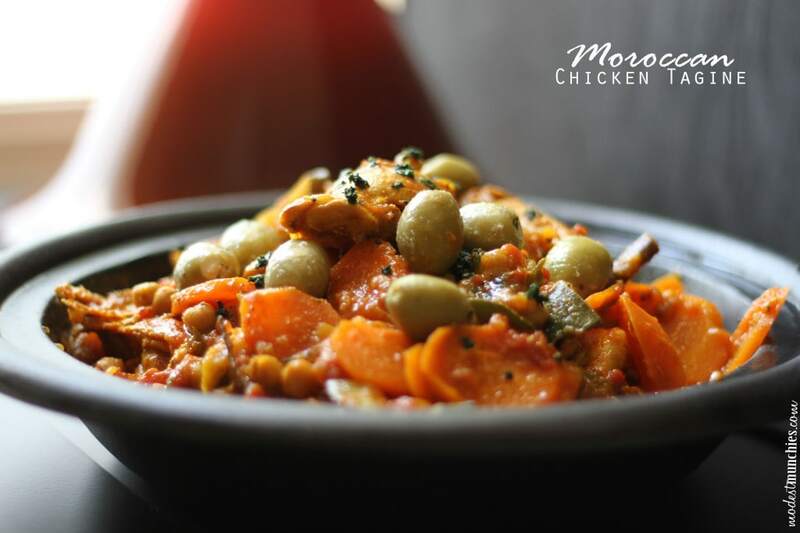 Maroccan food is a favourite in our house, in fact I think I could put it at the top of my Mr Munchies favourite type of cuisine. His birthday means baking a cake and making Moroccan, yip that’s all he needs for his birthday. I married a good one. 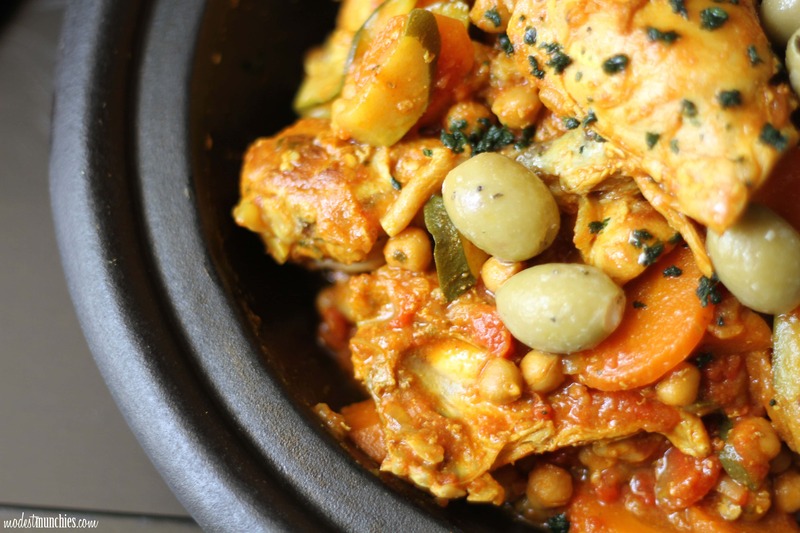 On the day, I made Moroccan Lamb stew (a dish I make often) and I tried this Chicken Tagine, it was yummy but I think the stew is our favourite. Lamb seems to be much better suited to Moroccan flavourings. I’ll have to bring you that recipe the next time I make it, I didn’t get a chance to take photos on the day. Start off by marinating your chicken in the garlic. 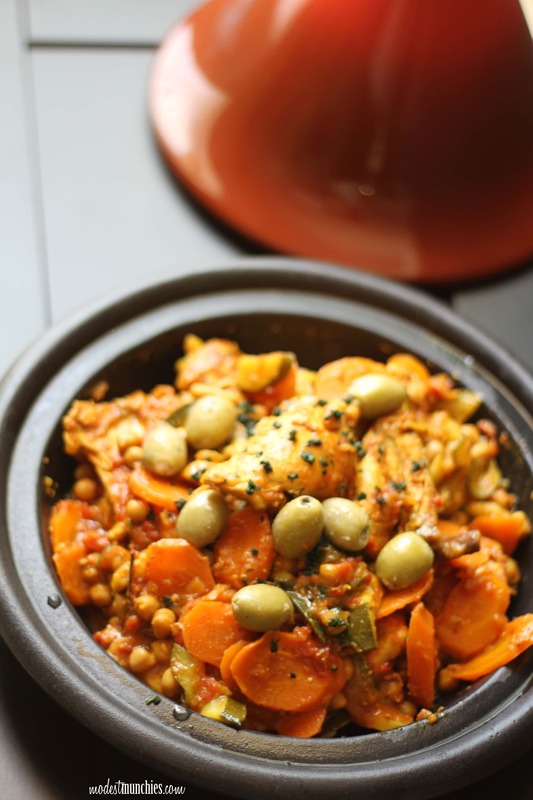 Get a pan heating on the stove (you could use a tagine base), add in the oil and the chicken and let the chicken brown over a medium to high heat. Once the chicken has browned add in the onion and cook until soft. Add in all the spices up to and including the can of diced tomatoes in the ingredient list and let cook on a high heat until the liquid starts to bubble. Add water and carrots, let cook for 15 minutes. Add in zucchini and chickpeas. Place a lid on the pot and let it all cook for a further 15 minutes or until the vegetables and chicken are tender. Throw in olives. Sprinkle with coriander to serve. Moroccan may seem a little foreign, but honestly most of us already have all these ingredients in our kitchen pantry. Give it a try, you won’t be sorry. Serve it with cous cous, or rice, totally up to you. I prefer cous cous, much more traditional. One more tagine shot, I couldn’t resist! Aww, yes he did, alhumdulillah. Thanks Henna.